I have always raved about Korean cuisine ever since I had the chance to dine in one of those hole-in-the-wall Korean carinderia in Makati many years ago. That is why I have been eyeing the Chef’s Noodles branch at the local mall but we never really get to try it there. 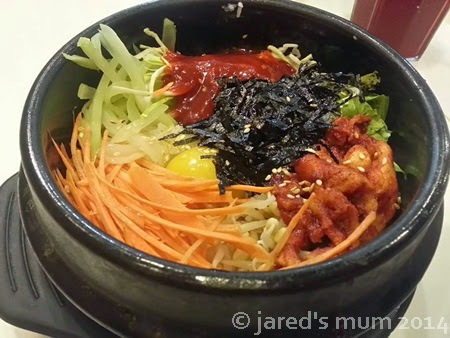 Good thing we finally managed to visit a few weeks back and got to taste their bibimbap. This dish is a traditional Korean dish and literally translates to “mixed rice.” Simply put, it is a bowl of warm rice topped with different ingredients, including beef, seafood, eggs and vegetables. I am a big fan of rice topping so I was really looking forward to trying this dish out. 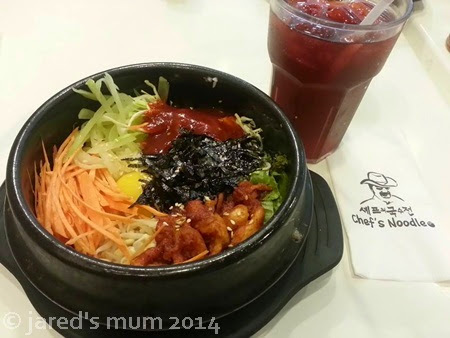 This entry was posted in food musings, foodie adventures and tagged dining out, korean food on 2.December.2014 by admin.